In the past two decades the art world has become obsessed with animals in a way that it never had been before. Animals, both alive and dead, have been inhabiting the gallery; confronting our gaze and challenging us to reassess our relationship to the world around us. Far more than the symbolic representations found in paintings and drawings of former centuries, the physicality of the animal body questions our relationship with animals and our commodification of the natural world. 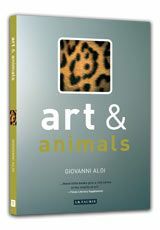 Giovanni Aloi’s book Art and Animals is a comprehensive and thorough guide to this complex yet engaging area. Each of the seven chapters poses a question of a different aspect of the animal in contemporary art, examining topics ranging from taxidermy to anthropomorphism and becoming animal to killing animals for art. The book is densely packed with references to artists, artworks, thinkers and texts which deal with the animal, yet is clear and easy to understand for those new to the subject. Drawing on the work of Mark Dion, SnæbjÃ¶rnsdóttir and Wilson, Oleg Kulik and Keira O’Reilly (among others); Aloi covers most aspects of contemporary art practice from the socially engaged and performative to the sculptural and photographic. These works are examined against the writings of many philosophers and theorists, including Deleuze and Guattari, Levinas and Derrida; which Aloi uses to carefully construct a full and wide ranging introduction to animals in art and to our cultural connection to other species beyond the art world. Despite being an introduction, this book has real substance and depth. Aloi does not shy away from the more difficult issues surrounding the morality of animals in art, giving balanced and thought provoking accounts of works which open up the ethical arguments involved in the use of the animal as medium. This extends to a recognition that this emotive subject is often picked up in media headlines, from Damien Hirst’s tiger shark to Marco Evaristti’s goldfish in a blender; each work has different ethical and social implications. Aloi suggests that, in some cases, the use of the animal, especially the killing of an animal for art; is nothing more than a chance for an unknown artist to be ‘discovered’. This honest yet somewhat controversial view, discussed in chapter six, highlights one aspect of a real problem with the art world today; that notoriety and financial ‘success’ are valued above artistic expression and genuine discussion. Perhaps the most enlightening part of the book was in chapter five where Aloi discusses the subject of plant intelligence and the limitations of language and human experience in the understanding of different organisms. Here he introduces the relatively new idea, first put forward by Professor Anthony Trewavas; that plants have intelligence and cognition, a fact that is difficult for us to accept as we find it difficult to equate our experiences with the entirely unknowable experience of a different life form. The book finishes with a conversation between Aloi and Mark Dion in which they discuss Dion’s work “Some Notes Towards a Manifesto for Artists Working With or About the Living World”. This openly titled and interesting work acts almost as a summary for the points made through the book. To end in this way not only allows the reader a further insight into one of the most prolific artists working with animals but also serves as an invitation to keep the conversation going. There is no real conclusion drawn in this book, but rather an invitation to respond to and engage with the subject matter. This book is without doubt an important read for anyone with an interest in the animal in art or in contemporary art more broadly. Beth Savage is an artist based in Dundee. Her work explores social boundaries and the human/nature relationship. Her current project the Urban Animal, is an investigation into the effect the urban environment has on both human and non-human animals.